Date: 29 January 2019, 3 – 5 p.m. Featuring opening remarks by H.E. Valentin Rybakov, Permanent Representative of Belarus to the UN, on behalf of the Group of Friends United Against Human Trafficking; as well as Ms. Kristiina Kangaspunta, Chief UNODC Global Report on Trafficking in Persons Unit; Ms. Kalliopi Mingeirou of UN Women (ICAT 2019 Co-Chair); and moderated by Ms. Simone Monasebian, Director UNODC NY Office. All with UN Grounds passes are welcome. Please RSVP to Schatz@un.org. China’s rise has become one, if not the most consequential developments for the world — an economic and geopolitical phenomenon that has not gone unnoticed by the U.S. The “Thucydides Trap” of great power conflict due to a state of mutual distrust has, therefore, become a subject of discussion in recent years. Are the U.S. and China destined for war? Join us for a screening of Better Angels, a documentary film that argues for the U.S. and China to overcome economic rivalries, ideological challenges and cultural differences to achieve mutually beneficial outcomes not only for both countries but also for the world. The UN’s Sustainable Development Goals (SDGs) seek to provide a roadmap for all governments to eliminate extreme poverty and achieve a range of other key economic and social goals by 2030. However, financing to achieve these objectives, including the eradication of extreme poverty, currently falls trillions of dollars short. Achievement of the SDGs is at risk unless current finance trajectories can be shifted. Jeffrey Sachs, the Special Advisor to the UN Secretary-General on the SDGs, and Philip Alston, the UN’s Special Rapporteur on extreme poverty and human rights, will discuss the relationship between finance, human rights, and the SDGs, including a focus on current trends toward privatization. Date: Thursday, 31 January 2019, 11 a.m. – 12:30 p.m. Date: 31 January 2019, 1 – 3 p.m. Organized by NGO Committee on Sustainable Development-NY. A rare convergence of experts on the human costs of war will discuss the often-ignored outgrowth of the global war on terror: two decades of civilian casualties. New York Times journalist and Marine Corps infantry veteran C. J. Chivers, winner of the Pulitzer Prize for his 2016 story about an Afghan war veteran suffering from post-traumatic stress disorder, will moderate the discussion. The panelists are Alissa J. Rubin, the Times Paris bureau chief who won a Pulitzer Prize for foreign reporting on Afghanistan in 2015; Azmat Khan, an investigative reporter and New York Times Magazine contributor, who uncovered civilian casualties among nearly 150 airstrike sites across northern Iraq; and writer Brian Castner, a veteran of the Iraq war and weapons expert for Amnesty International’s crisis team, who also investigates war crimes and human rights violations. Islamophobia, Race, and Global Politics is a powerful introduction to the scope of Islamophobia in the U.S. Drawing on examples such as the legacy of Barack Obama and the mainstream media’s portrayal of Muslims, Professor Kazi highlights the vast impact of Islamophobia, connecting this to a long history of US racism. Professor Kazi shows how American Islamophobia and racism occur within the borders of the United States, and as a matter of foreign policy and global politics. February 7, 7:00 pm – 9:00 pm : A Conversation with Scott Shay: Does Faith Unite or Divide Us? The Jewish Week in partnership with Hebrew Union College-Jewish Institute of Religion is proud to present this conversation with Scott Shay and Rabbi Angela Buchdahl, Rabbit Elliot Cosgrove and Rabbi Chaim Steinmetz. Video message by H.E. António Guterres, United Nations Secretary-General, on the Holocaust Remembrance Day (27January 2019). The “Holocaust Remembrance” resolution designates 27 January as an annual International Day of Commemoration in memory of the victims of the Holocaust – observed with ceremonies and activities at United Nations Headquarters in New York and at UN offices around the world. In 2016, the United Nations General Assembly adopted a resolution (A/RES/71/178) proclaiming 2019 as the International Year of Indigenous Languages, based on a recommendation by the Permanent Forum on Indigenous Issues. The Equator Prize 2019 will be awarded to outstanding community and indigenous initiatives that are advancing nature-based solutions for local sustainable development. 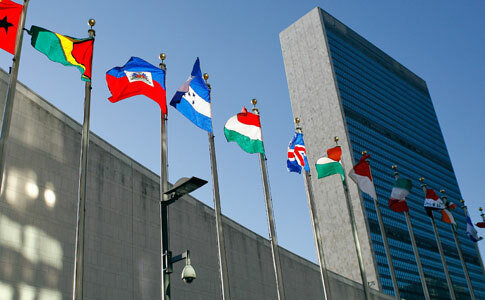 Each winning group will receive USD 10,000 and will be invited to participate in a series of policy dialogues and special events during the United Nations General Assembly and the Secretary-General’s Climate Summit in New York in September 2019, culminating in a high-level award ceremony at the beginning of Climate Week. The Equator Prize 2019 will have a special focus on initiatives that protect, restore or sustainably manage natural environments, initiatives that promote local models for climate-smart food and agricultural production systems, and innovative ways to finance nature-based solutions for sustainable development and climate change. Global growth is expected to remain at 3.0 per cent in 2019 and 2020, however, the steady pace of expansion in the global economy masks an increase in downside risks that could potentially exacerbate development challenges in many parts of the world, according to the World Economic Situation and Prospects 2019. ‘Dysfunctional’ response to common problems, shows need for effective multilateralism. Watch Special Address by António Guterres, Secretary-General of the United Nations at Davos 2019. Through the story of young Holocaust victim, Ruth Maier, this exhibition portrays the broader history of the Jewish refugees’ search for safety during the Holocaust. It shows the courage and desperate choices Jewish parents made to keep their children alive. Ruth’s diaries and writings provide a searing testimony of creative promise destroyed through the actions of the Nazis and their collaborators and supporters. This exhibition relates the unique stories of dozens of diplomats from the Holocaust period who have been recognized by Yad Vashem, the World Holocaust Remembrance Center, as Righteous Among the Nations. Presented in connection with the 2019 Holocaust Commemoration, the exhibit is dedicated to all Righteous Among the Nations, and the Holocaust survivors whose courage and resilience inspire all.